Stewart-Warner was founded in 1905 in Chicago, and by 1912 produced a speedometer that was used in the Ford Model T. As well as vehicle instruments, they manufactured radios and refrigerators among other products. Here is a radio you don't see very often. This is the first one offered for sale at the Radio Attic. There were several different radios offered with the 110 series chassis. This one was designated R-110AT, the "T" stands for twin speakers. This ten-tube, three-band (SB, SWx2) radio had other features like a noise suppression circuit, AVC, and push-pull audio, all very innovative for 1933. We went through the chassis replacing all of the capacitors, checked all of the tubes and resistors, replacing where necessary. We added a new cord, safety fuse and a cable to use an external device. 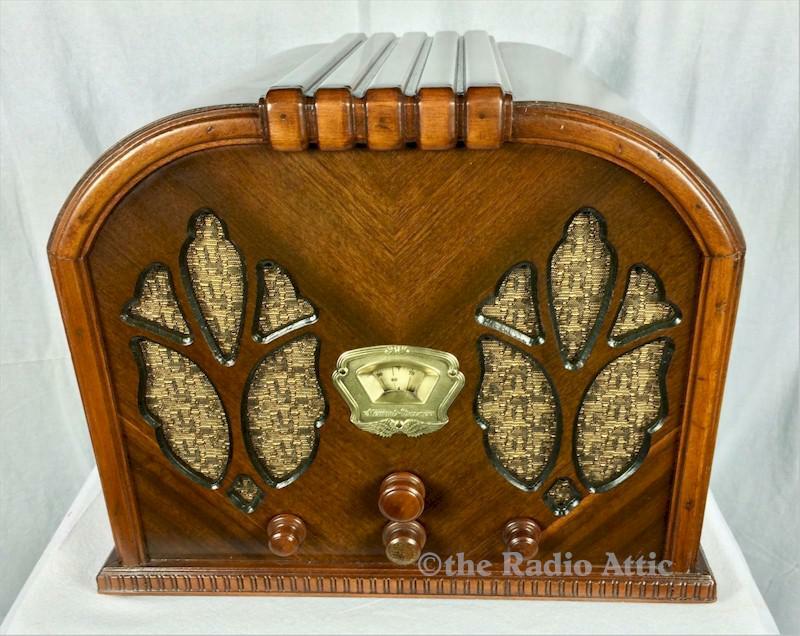 An alignment was done making this radio a strong performer across the dial. The cabinet was in great condition, and Gary cleaned it up and applied a thin coat of lacquer. All of the knobs are original, and we put in a new, period-correct grille cloth. 16"W x 13"H x 12"D.
You are visitor number 612 to this page.